I love the stealth genre, from Thief 2: The Metal Age to the Tenchu series, and even the stellar Mark of the Ninja, nothing is more exhilarating than lurking in the shadows trying not to be caught and then executing the perfect kill. Aragami, from developer Lince Works, released last year and was thought of as a budget Assassin’s Creed meets Dishonored featuring more stealth. 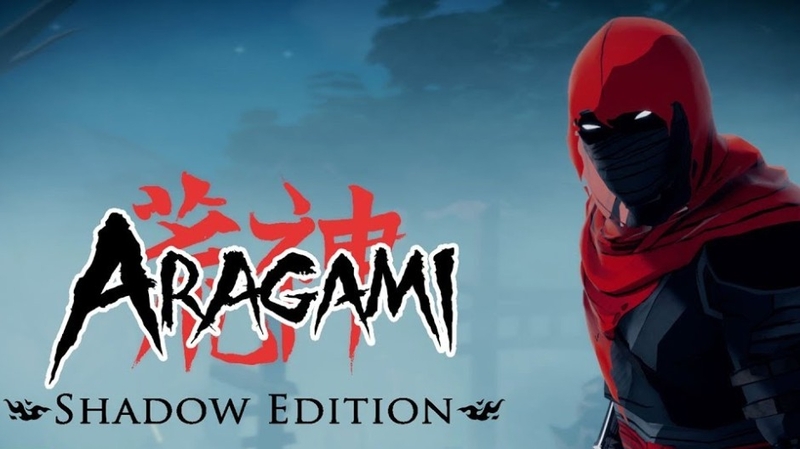 Now, Aragami returns for the Nintendo Switch with the Shadow Edition, which includes the Nightfall story DLC campaign and a few other extras to try and satisfy your stealth needs. In Aragami you play as, well… Aragami, an undead assassin summoned by a kidnapped princess and it’s up to you to rescue her. The story was intriguing and told throughout cutscenes as well as dialogue between the two as you play. Your goal is to infiltrate the army of light and set the princess free. Armed with a sword and the abilities to control the shadows, you must use your wits and powers to stay out of sight as you delve deeper into enemy territory. While playing, the princess will speak to you through an orb of light and marks your current objective on a map. This is a brutally unforgiving environmental stealth title and the only way you can succeed is by remaining in the shadows. Essentially, the shadows are your main source of life and they give you power. If you step out into the light though, your power will be drained and you’ll be put at a severe disadvantage with the patrolling guards. As you progress through Aragami you can find hidden scrolls to unlock new shadow abilities, like going invisible for a short time or creating a shadow at will for you to hop between platforms. Thirteen levels consist of the main campaign, which will take you around six to seven hours to complete, depending on your stealth skills. You’ll always be graded at the end of each level in a variety of categories and mainly it’s most important to not be seen or getting through a level without killing anyone, and I would advise you not to be detected as it’s pretty much a death sentence. Whether you want to slay everyone that stands in your way or move through the shadows completely unseen is entirely up to you. Aragami reminded me a lot of Mark of the Ninja, except it’s in 3D and has co-op capabilities. Using any of your shadow abilities consumes shadow essence, so you can’t just spam your abilities to your heart’s content. Sticking to the shadows is the only way to regenerate your essence and avoid the light that drains it. The stealth mechanics were excellent and I got a lot of enjoyment with trying to stay in the shadows and executing the trajectory through a level. Being able to teleport to the shadows and violently stabbing or avoiding as many enemies as I could, was immensely satisfying and booth playstyles are equally as impressive. For as much as I like the kill animations though, it would sometimes get me killed. I would be trying to teleport, only to be stuck in the middle of an animation and unable to escape. You can avoid attacks if you’re quick enough, but you will get one shotted if you aren’t careful. The AI was decent for the most part and they would sound the alarm if I got sloppy. Leaving bodies around was usually how I got caught, so I wish there was a way to move the corpses. Later on, you do get the corpse vanish ability and that is extremely useful, I just wish it was given right at the get-go to take away some of the frustration of not even being able to drag anyone. While the AI are smart for the majority of my time playing, I found it funny that they never noticed the giant pools of blood all over o the fact that I had already killed over half their allies. It would have been nice to have a higher difficulty setting from the default three, as the AI never really became more difficult to get around, you would just die more quickly or more would be patrolling around. Controlling Aragami is easy and while the controls using the Joy-Con lacked customization, the default button combinations still felt natural and responsive. There are exploration aspects to Aragami as well, with the aforementioned scrolls being of most significance to find for unlocking upgrades. Some of these upgrades were active items and they gave me more flexibility with how I wanted my assassin to perform. You can unlock six activated abilities, however, you can only equip one at a time. It’s safe to say the different abilities would have flown better if you could have had more than one ability bound at a time without having to change the selected skill. You are also limited by having two charges for each ability, but you do replenish these charges by visiting a shrine. I really liked the art style and graphics of Aragami, and while it wasn’t mind-blowing in presentation, everything was elegantly designed and visually appealing. The music and sound effects were done well and I found the more subdued nature of the music lending very well to the art-style and gameplay. I also appreciated how the music would change when entering combat and it makes everything feel more exciting. Aragami: Shadow Edition is a solid stealth title with fun to use abilities. The AI could have been more polished and aware of their surroundings, but Aragami does make you feel like a true assassin trying to hide in the shadows. While Aragami can be a fun, satisfying, and challenging game, it’s ultimately held back by a lack of polish and questionable AI that should have been addressed with the Switch version. However, this is an easy game to recommend for anyone who is a fan of stealth titles, but it might vary for everyone else as this is not a game meant to be a heavy action experience.